Human Brain Has A Direct Link To The Immune System After All : Shots - Health News For centuries, scientists thought the human brain had no direct connection to the body's immune system. Now researchers seem to have found one, and say it may offer clues to multiple sclerosis, too. 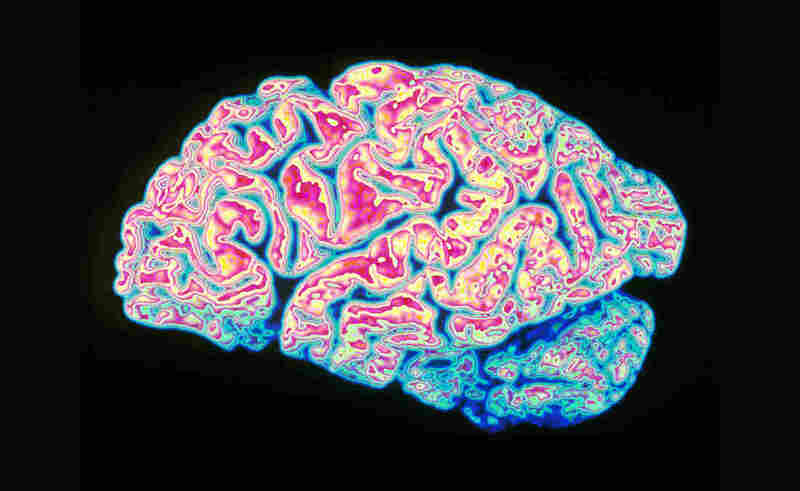 Alzheimer's disease causes atrophy of brain tissue. The discovery that lymph vessels near the brain's surface help remove waste suggests glitches in the lymph system might be involved in Alzheimer's and a variety of other brain diseases. Lymphatic vessels are a part of the lymphatic system, which extends throughout the body much like our network of veins and arteries. Instead of carrying blood, though, these vessels carry a clear fluid called lymph, which contains both immune cells and waste products. The new finding bolsters recent evidence in rodents that the brain interacts with the body's lymphatic system to help fend off diseases and remove waste. Until a few years ago, scientists believed that the brain's immune and waste removal systems operated independently. The discovery of lymphatic vessels near the surface of the brain could lead to a better understanding of multiple sclerosis, which seems to be triggered by a glitch in the immune system, says Dr. Daniel Reich, an author of the study and a senior investigator at the National Institute of Neurological Disorders and Stroke. "How the immune system interacts with the brain is fundamental to how multiple sclerosis develops and how we treat multiple sclerosis," Reich says. Current treatments for multiple sclerosis often involve drugs that suppress the immune system. The research also has implications for diseases like Parkinson's and Alzheimer's. These diseases occur as certain toxic waste products accumulate in the brain. And lymphatic vessels appear to be part of the system that usually removes these waste products. "The discovery of a lymphatic system in the brain raises the possibility that a disorder of the lymphatic system is somehow involved in the causation of Alzheimer's disease," says Dr. Michael Weiner, a professor of radiology at the University of California San Francisco, who was not connected with the study. That sort of thinking is a radical change from just a few years ago, Reich says. For centuries, most scientists believed that the body's lymphatic system didn't connect to the brain, Reich says. "The brain is thought to be what is called immune-privileged," he says. "It has a different immune system from the rest of the body." So Reich was intrigued when he heard a talk in 2015 by Jonathan Kipnis, who directs the neuroscience department at the University of Virginia. "He showed very clearly in this talk that there are lymph vessels in the head, which I had learned in medical school didn't exist," Reich says. But the evidence was in mice. So Reich and a team of scientists used MRI to study the brains of several human volunteers. The scientists injected a special dye into the bloodstream, then watched to see where it went. They focused on the dura mater, the outermost membrane that protects the brain and nervous system. As expected, the team saw some of the dye leak out of blood vessels in the dura mater. But then they could see that the leaked dye was being collected by different vessels – which is exactly what happens in the lymphatic system. "That gave us some evidence that there are vessels here that are behaving different from blood vessels," Reich says. "But we weren't sure that they were lymphatic vessels." To be certain, Reich's team spent years perfecting a technique to reveal the lymphatic vessels in the dura mater of brains taken from human cadavers. This allowed the scientists to confirm the presence of these vessels near the surface of the brain. And it strongly suggested that the lymphatic system interacts directly with the brain. The results extend the findings of a landmark study published in 2013. It found that the brain appears to flush out waste products during sleep. But it wasn't clear how these waste products were draining out of the head. Now it appears that at least some of the waste might be exiting through the lymphatic system.